Port of Spain (Agenzia Fides) - The area most affected by recent Hurricane Irma regards the northern islands of the Antilles (see Fides 20/9/2017). The most affected and damaged dioceses are Saint John's-Basseterre, which includes the islands of Antigua and Barbuda, St. Kitts-Nevis, Montserrat, Anguilla and the British Virgin Islands, the northern part of the diocese of Basse-Terre (et Pointe- à-Pitre), the northern part of the diocese of Willemstad (St. Martin Island), the Turks and Caicos sui iuris Mission, the Archdiocese of Nassau (Bahamas Islands). "Yesterday afternoon I spoke to Mgr. Llanos, Apostolic Administrator of the Diocese of Saint John's-Basseterre over the phone, and this morning we spoke with Vicar General, Fr. Pierre Tevi-Benissan", said to Fides Fr. J. Kaboré, Chargé d'Affaires of the Apostolic Nunciature of Port of Spain. "Bishop Llanos went to the affected islands for about a week, in particular in Tortola, Anguilla, Virgin Gorda, almost completely devastated, and shared daily life with the locals. Churches and parish houses are severely damaged. Mgr. Llanos asked that Sunday's collection is to be offered to help the hurricane victims. In the meantime two large containers with basic necessities, food, medicines, etc. have arrived from Trinidad, and other five small ones destined for Tortola and Anguilla were sent by Antigua, St Kitts and Nevis. The population is trying to survive, not only material and economic aid are needed, but also counseling, moral and spiritual encouragement, and it is for this reason that Mgr. Llanos, after having been there, has decided to send another priest to Tortola to give courage and hope. Even Father Pierre Tevi-Benissan said that he will soon be on the island", said Father Kaboré. "On 2 October, Mgr. Jason Gordon, Bishop of Barbados and vice-President of AEC, was here in our Nunciature in Port of Spain", continues Father Kaboré. "The AEC (Antilles Episcopal Conference) is very active and is moving in particular towards Dominica which has been severly devastated after hurricane Maria and where containers from Trinidad have already arrived. Moreover, Mgr. Gabriel Malzaire, Bishop of Roseau, Dominica, and President of the AEC, sent a short video in which one can see the devastation of the island, and the help of the entire international community is needed. 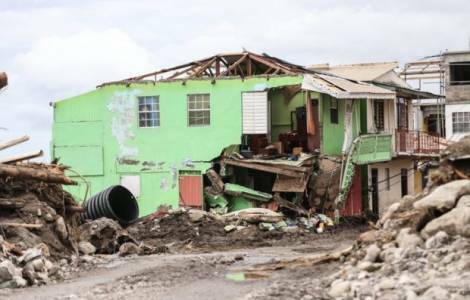 A report on damaged ecclesiastical structures (as well as in the diocese of St John's Basseterre) is also being implemented. In Trinidad Prime Minister, Dr. Keith Rowley, has appealed for solidarity in favor of Dominica, and has also asked - despite conflicting opinions - to soften immigration policy and welcome those from Dominica seeking better living conditions in Trinidad and Tobago".